On the east coast of Barbados lies the parish of St. John, blessed with scenic sandy beaches and some towering cliffs, from which there are spectacular views of the bays and the large waves that crash along Barbados eastern shores. The coast along the small fishing village of Martins Bay has a long shoreline, protected by large and colourful coral reefs. The place is perfect for snorkelling and surfing, though strong currents do not make this an ideal place for children and inexperienced swimmers. Another small fishing village, St. Mark's near Conset Bay has a seafood market that sells fresh fish and other marine products. The water in and around this bay is not recommended for swimming. Facing Conset Bay is Codrington College, the oldest Anglican theological college in the Western Hemisphere and a grand estate on top of a hill with a beautiful view of the Atlantic. A must-visit is Villa Nova, the country holiday home of a former British prime minister. Built in the early half of the 19th century, the mansion was once graced by Queen Elizabeth II and Sir Winston Churchill. 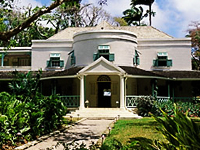 In 2001, it was transformed into a country hotel which boasts of many antiques and mahogany furniture.